Our nighttime flight with Easyjet from Nice arrived on time, but rather than face a midnight cab ride to our Airbnb flat we opted to stay at the Tryp hotel. 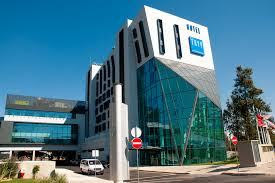 This lovely, modern hotel with a welcoming staff and superb breakfast is literally a few short yards across from the Lisbon Airport Terminal. Talk about convenient! The next day we took a cab to Rossio Square to meet our Airbnb apartment hostess, Sandra. Via email she'd explained our flat was located behind the National Theatre (below) and we agreed to meet her there at 13:00. Once we arrived at the square and saw all the people we wondered how on earth we'd ever find her. We didn't even know what she looked like! Imagine our surprise when the taxi stopped and before we exited she called me by name! (As Airbnb clients our photo is attached to our profile and that's how she recognized us.) This kind of personalized service is what attracts us the Airbnb. If you're curious about it, email me and we'll talk. The small 1-bedroom apartment had everything we needed, including a fully equipped kitchen and could not have been more convenient. We were in the thick of things and able to walk everywhere. The large square south of the Theatre contains statues, fountains, and benches for those who want to people watch. I had to stop and admire this art nouveau store front. That's John window shopping on the right. One feature that constantly made me wobbly was the intricate mosaic tile pattern. The visual effect made me feel as if I was either walking in a rut or perched atop a slight knoll. 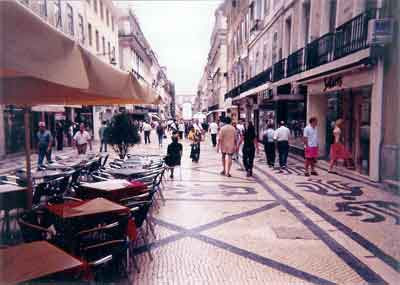 All around the square are souvenir shops, restaurants, bakeries selling those delectable pastels, cafes and shoe stores. We've never seen so many shoe stores during our travels. Not anywhere. My guess is the Portuguese have a definite and collective shoe fetish going on. The next few shots are of the city streets, many of which are heading up or down a hill. Some of the streets include elevators that transport people from one section of town to another. Some thoroughfares are wide enough for three or four lanes of traffic, others are mere alleys. designed only for people and perhaps the occasional donkey. Laundry is hung from every conceivable place. A lovely reminder that Lisbon is not simply a tourist destination, but home to so many people. It's a sprawling city that's been inhabited for at least 2700 years. This south west view faces the Tagus River and the Vasco da Gama Bridge. South east view of the Tagus. Homes are built next to each other and every inch of space serves many purposes. These primary coloured 'buildings' on a roof top below belong to an elementary school. It's the children's playground. Back exploring the centre of Lisbon are more squares, monumental buildings and intricate mosaic patterns. Pedestrian only streets are one of the wonderful things I love about Europe. We walked along this street almost everyday and stopped more than once at a sidewalk cafe for lunch. Convenient and enjoyable...and in the middle of February no less! What's not to love? At the far end of the photo above is an arch. This closeup shows the intricate carvings while it beckons visitors to the waterfront. Walking under it we arrive at another massive square on the edge of the Tagus River. See all of the arches on the lower level of that yellow building? They offer passage to a covered hallway. One day it was filled with crafts people selling their wares. Cafes also set up chairs and tables for their patrons. In the square is a statue of King Jose I, a statement to Portugal's impressive past. Lisbon's trolleys are a definite tourist must do. They've transported people around the city since 1873, although the first electric tram entered service in 1901. They're often crowded, and signs warn tourists to be on the lookout for pickpockets, but we didn't have a problem. Another mode of transportation is the tuk-tuk (below left). They're available for hire for a short ride or comprehensive city tour. While #28 is the number one recommended trolley line we just hopped on one to see the less touristy parts of town. It was a fun experience. We even managed to grab a seat on an near empty trolley, but by the end of the journey it was standing room only. The polished wooden interior is reminiscent of a bygone era. At the waterfront there is always something going on...whether it's people watching, enjoying a meal or beverage at one of the many, many sidewalk restaurants or cafes. There are always buskers and street musicians as well. This particular outdoor cafe came complete with a fisherman's boat as the bar. Playing tourist is hard work and one of the best rewards is a delicious meal. 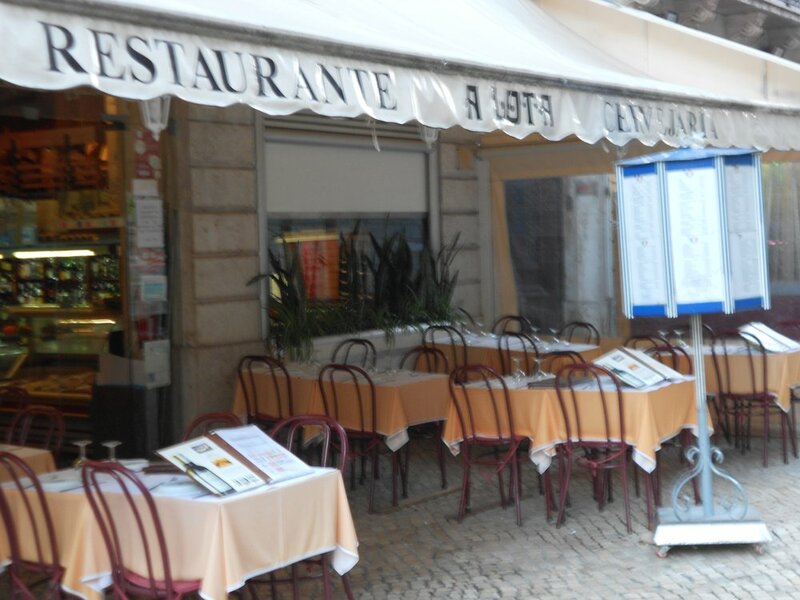 Literally around the corner from the Rossio Boutique Apartment is the A Lota Restaurant. The menu (printed in 4 or 5 languages) made us drool and we opted for a traditional Portuguese fare. I ordered the Wild Boar and Prawn Cataplano. The waiter explained a cataplano is the copper pot the meal is cooked in. The A Lota version uses sliced potatoes while others just cut them in half or quarters. John ordered Monkfish and Prawn kebabs. We topped it all off with a bottle of Portuguese white wine, and voila...food gone! The owner then poured us a glass of port - compliments of the house. Wonderful memories of a gracious host and delicious meal in Lisbon.